The numbers at the heart of influencer marketing are pretty eye-opening with 94% of marketers finding it effective. This doesn’t mean that marketers are paying millions of dollars to celebrities as many of them are focussing on micro influencers and getting some great results. This infographic from One Productions takes you through how you can use micro influencers to help grow your brand. Micro influencers have a lot of benefits because their audience is far more engaged and active. Macro influencers can have extremely passive followers and even though your product will be seen by more people, fewer will actually act upon it. Micro influencers are also far cheaper than macro influencers and any celebrity such as Selena Gomez will cost so much more to promote your product than a micro influencer. Engagement is a very interesting area when it comes to influencer marketing. To the untrained eye, it may seem as if having a lot of followers will result in more people buying your product, but the reality is video engagement rate takes a massive nosedive as followers increase. Micro influencers have a more passionate following but as their audience increases, the following becomes more passive. The reality is that micro influencers beat macro influencers on nearly every test. The trust element makes a big difference as only 3% of people say they would buy a product if it were endorsed by a celebrity whereas 30% are more likely to recommend a product based on a recommendation from a non-celebrity blogger. This is an incredible statistic as people just don’t seem to trust celebrities when they endorse a product. People seem to be keenly aware that they are only doing it for the money, but micro influencers are a bit more moralistic. The reality is that if people are not too familiar with influencer marketing, they should take a look at it. It can generate 11 times the ROI of traditional marketing, so it would be foolhardy to ignore it’s ‘influence’. 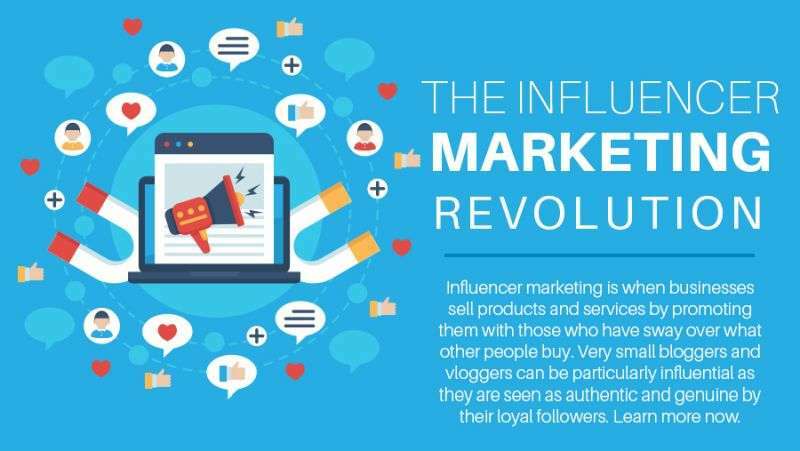 Check out the full infographic now for a detailed analysis of how impactful influencer marketing revolution can be.